Amy Gallo's husband wasn't supposed to be home from his six-month deployment for another week, but he had managed to get a seat on an earlier flight. "So when he called me that morning, I was blessed," she said. That happy phone call would be the last time Gallo would speak to her husband. The plane carrying Sgt. Richard Nichols and 247 other soldiers, most of them from the 101st Airborne Division's 3rd Battalion, 502nd Infantry Regiment, crashed shortly after taking off from a refueling stop in Gander, Newfoundland, Canada. All 248 soldiers and the plane's eight crew members were killed. It was Dec. 12, 1985, and the soldiers were on their way home from a peacekeeping deployment in the Sinai. The crash was the deadliest tragedy to hit the famed Screaming Eagles division in years. "How do you tell 248 family members their husbands are dead?" Gallo said. "I've never heard so many women yelling and screaming in my life." This year marks 30 years since that dreadful day, and later this week, soldiers, veterans and surviving family members will gather on Fort Campbell, Kentucky, to commemorate the 30th anniversary of the crash. The Army has marked the anniversary of the crash every year since it happened, but this year is significant, said Col. Brett Sylvia, commander of 2nd Brigade Combat Team, 101st Airborne. "This was the single largest loss of life in a single event in a single day that this division has ever experienced," Sylvia said. This week's events will be a chance to bring together veterans and family members, some of whom have not returned to Fort Campbell since the tragic crash, he said. "Thirty years is a big milestone for them," Sylvia said. "They want to have this reunion. I think they, to some degree, need to know that we still mourn with them this particular event." 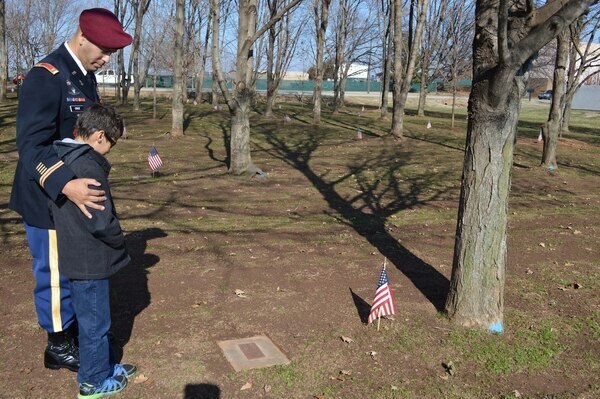 Chief Warrant Officer 2 Mickael Cruz, 160th Special Operations Aviation Regiment, and his son, Joshua, look at the Gander memorial tree for Cruz's father at Fort Campbell, Kentucky, last December. 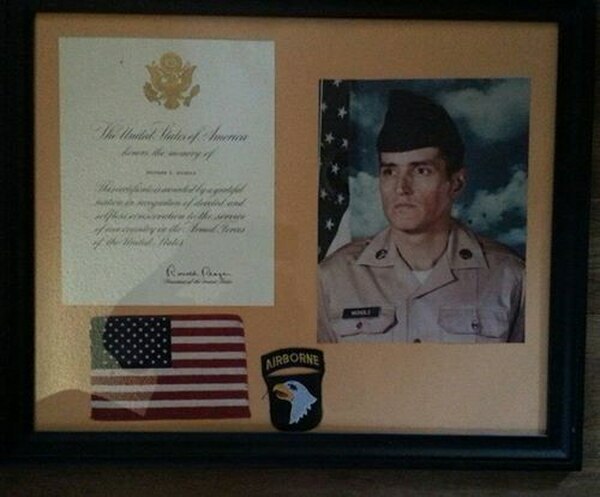 Cruz's father, Staff Sgt. Francisco Cruz Salgado, was among 248 Soldiers who lost their lives in a plane crash in Gander, Newfoundland, Dec. 12, 1985, while returning home from a peacekeeping mission in Sinai, Egypt. On Friday, soldiers from 2nd BCT will host an open house and a social for attendees. This will give veterans and family members a chance to see what it's like to be in the Army today, Sylvia said. It also gives his soldiers a chance to connect with those who came before them, he said. A memorial ceremony is scheduled for 10 a.m. Saturday on Fort Campbell. A second memorial will take place at noon at the Fort Campbell Memorial Park in nearby Hopkinsville, Kentucky. Organizers expect about 500 veterans and family members to attend. Sylvia said he hopes the surviving family members and veterans know that the soldiers of today value them and their sacrifice. "Once you're a member of the Strike family, you're always a member of the Strike family," said Sylvia, referring to 2nd BCT's nickname. In addition to the veterans and surviving family members, the plane crash profoundly impacted the 101st Airborne and its surrounding communities, and that impact is still felt today, Sylvia said. "Gander is almost like 9/11 here," he said. "You can ask any of these members of the community here, and they can tell you exactly where they were and what they were doing when they heard the news about this crash. It's part of the fabric of this community." For Ira Richardson, the commemoration is a chance to connect with the families of the fallen. "There are probably going to be people in that room who were either not born or under 5 years old in 1985, and they never knew their father, uncle or brother," said Richardson, who was a staff officer in 3rd Battalion, 502nd Infantry at the time of the crash. "It is our duty to find these young people and tell them whatever we can of their relative … and pledge to be a part of their adoptive family going forward. That's going to be my challenge." Richardson was still in the Sinai when the plane crashed. The Army had chartered three flights to bring the soldiers home, and because it was so close to Christmas, he and other single soldiers had decided to let the married soldiers go home first. "It was always the plan that all of us bachelors would come home last, which seemed like a brilliant idea at the time," Richardson said. "The first two flights were frontloaded with married guys. That doubled the tragedy of the crash because everybody had a family." Audrey Caudill, mother of Spc. 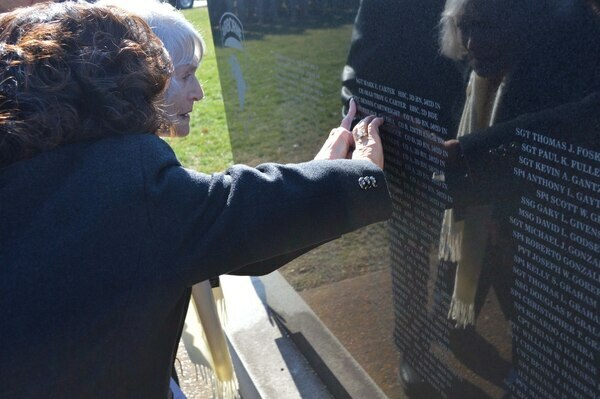 Philip Caudill, runs her finger across her son's name at the Fort Campbell Gander Memorial, Hopkinsville, Kentucky, on Dec. 12, 2014. Caudill's son died when a plane carrying 248 soldiers crashed in Gander, Newfoundland in 1985. The crash and its aftermath were "just horrific," Richardson said. "Survivor's guilt either forces you to do something significant or it drives you into a hellish abyss," he said. "Fortunately, some of us got past it. Some of our soldiers in the task force haven't." Richardson, who stayed in the Army until 1999 and retired as a major, said the battalion didn't lose any soldiers during the deployment. Canadian aviation officials said the cause of the crash was ice on the wings. "The great irony of our rotation – we were the eighth iteration – was we didn't lose a single soldier in the Sinai. We were the first of eight to do that, then we lost 248 in that crash," he said. "What a cruel, cruel, life." 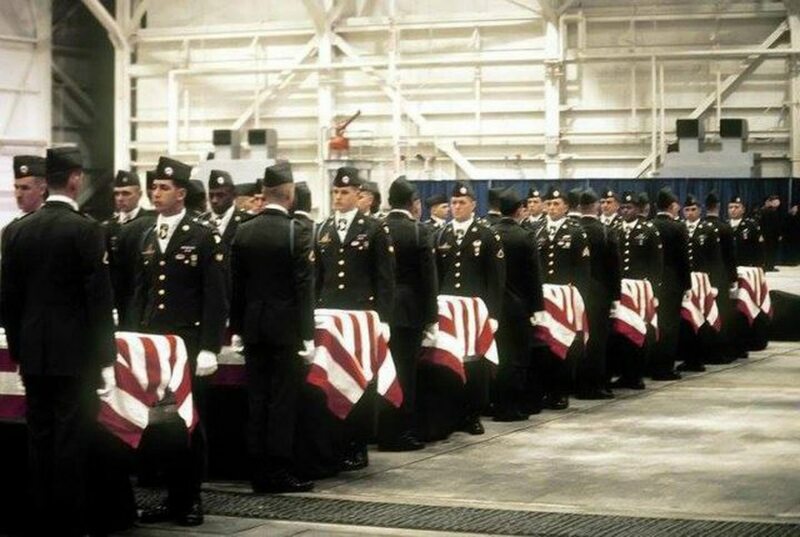 He and his fellow soldiers who survived cope with the loss in different ways, said Richardson, who is now a financial planner in Jacksonville, Florida. "Marriages and jobs didn't work, there was a lot of loss," he said. "We lost 248 soldiers, but we lost 10 times that in opportunities to go on and be productive." Gallo, who is on the committee for the upcoming commemoration, said she wants to reach out to the surviving soldiers. "These guys have been carrying this for 30 years. I want them to know we don't blame them. It's not their fault," she said. "I spoke to one gentleman who was the gentleman who gave up his seat to my husband. He was terrified to talk to me. He asked me, 'do you still hate me?' I said, 'I've never hated you.' It never occurred to me to hate him." Sgt. Richard Nichols was one of 248 soldiers killed when their plane crashed after takeoff from Gander, Newfoundland on Dec. 12, 1985. In the days after her husband's death, Gallo said "an older lady" came to her house. "Her name was Lucille, I don't know her last name, but she came and she said, 'I'm a widow,'" Gallo said. "She was the first person I was able to look at and say, 'oh, my, someone who could understand me.'" Lucille helped Gallo through her darkest days, helping her pick a casket and work through mountains of paperwork. "You're at your bottom then," she said. "It's like your world is over. You can't even contemplate your life. I couldn't even function. If [Lucille] hadn't come, I know I wouldn't have made it." After a while, Lucille stopped visiting, but her help inspired Gallo to pay it forward. "I was so thankful for that woman who could talk to me about all the feelings you go through," Gallo said. "She told me 3 o'clock in the morning is the hardest time. It is the hardest time." She has since provided support to Gold Star families from the first Gulf War and later Iraq and Afghanistan. In the years since the crash, Gallo has remarried and had more kids. This week, Gallo and her two kids with Nichols, Chip, now 33, and Suerita, now 32, will attend the events on Fort Campbell. It will be a chance to remember Nichols, who fellow soldiers called the old man because he didn't join the Army until he was 30, Gallo said. Nichols joined the Army to be a pilot, but was disqualified for being color-blind, Gallo said. He then became an infantryman and loved every minute of it, Gallo said. "Any given Friday, I could have anywhere from three to 15 soldiers in my house," she said. "I've never seen a man who loved being infantry as much as he did."